Romanian president Traian Basescu. Flickr/Lucian Crusoveanu. Some rights reserved. With more than 50 percent turnout, the first round of elections was won by Social-Democrat Victor Ponta with around 40 percent of the vote. In second place was center-right candidate Klaus Iohannis from the Liberal Christian Alliance, who will face off Ponta in the decisive round on 16 November. Three other popular center-right candidates scored disappointing results of around 5 percent: independents Calin Popescu-Tariceanu and Monica Macovei, and Elena Udrea from the Popular Movement Party, the new political project of Traian Basescu. The Social-Democrats are currently in control of the government (Ponta has been a prime minister since 2012) and many in Romania feel that winning the presidential seat would give the party too much power. In Romania, the president does not yield too much executive power, but he can veto legislation. 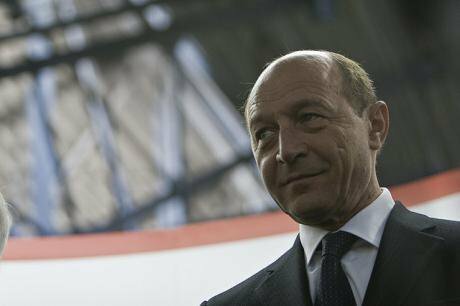 Basescu has already set an example of how it is possible to yield considerable influence over the country’s political life even from the Cotroceni Palace (the presidential office). Ponta’s Social-Democrats are hated by many among Romania’s public intellectuals and media figures as well as among the country’s new middle classes. They are seen as a relic of the Communist Party, corrupted and systematically resisting a proper liberalisation of the Romanian economy. It is still a common view in Romania that the country’s economic problems are primarily derived from an incomplete implementation of liberal reforms. Victor Ponta, in his turn, may have given some signs of hope for the reform of the party when he appeared on the political scene, but he has disappointed since. Not only is he seen as a facilitator for the local barons holding the power in the party but be has also angered Romanians by an often dismissive tone in public appearances and, importantly, by repeatedly taking back promises. Ponta came to power in 2012 parading an anti-austerity discourse (Basescu, Ponta’s arch-enemy, was one of the strongest austerity proponents in Romania) and promising to put an end to projects such as the gold mine at Rosia Montana or shale gas drilling, both of which brought Romanians to the streets for the first time in years. After coming to power, he reversed those positions basically over night. Finally, in 2012 he was accused by the European Commission of pushing the limits of the Constitution in order to defeat political enemy Traian Basescu. The main candidates running in these elections, belonging mostly to the center-right, as well as some of the main media channels chose to depict these elections as a battle to get rid of Ponta’s corrupted retrograde socialists. This was a message that was picked up strongly on social media, and particularly boosted candidates Klaus Iohannis and Monica Macovei (they seemed the “freshest” from all the candidates of the center-right). Important to the spreading of this ‘good vs. evil’ narrative of the elections (at least in the online space) was also a certain mood among a narrow part of the electorate, those who took part in or felt close to the protests for Rosia Montana last year. Many of those protesters felt a need to see an electoral expression of their battle last year (protesters taking to the streets for Rosia Montana were also rebelling against a political class perceived to be corrupted as a whole). While some of these people did not vote, many of them chose to vote with the center-right in order to reject Ponta, and most strongly favoured Monica Macovei. A former justice minister credited with having implemented reforms that made it possible for Romania to join the European Union, Macovei ran as an independent, relying primarily on social media and volunteers. She depicted herself as the only salvation for Romania (all the other politicians are corrupted, only Macovei has proven herself to be able to fight corruption) and she presented her political programme in the form of Ten Commandments. Despite her good reputation, Macovei scored well below expectations. This was probably because she did not have the back up of a party apparatus (unlike Iohannis, for instance, who was supported by an alliance of the two most important center-right parties in Romania). But it may have also been because she ended up presenting a very radical image: in her programme, she proposes a minimal state and continued privatisations in the already battered healthcare and education systems; even for those who did not read the programme, the fact that she was publicly endorsed by some of the most neo-liberal public figures in Romania constituted a warning sign. The programmes of the main-center right candidates were, in fact, quite similar. They all pursued the line of the incomplete liberalisation and of the need to support the business sector as a means of achieving development. Despite such similarities, old conflicts, egos and personal interests prevented the candidates from forming a pre-electoral alliance of the right which would have avoided a fragmentation of votes. Klaus Iohannis was the best performer, both because he was supported by the strongest political force on the center-right but also because of his stellar reputation as mayor of Sibiu, a town in central Romania which was dramatically modernized under his management. Interestingly, Iohannis is a Romanian citizen of German origin and this in Romania constituted a plus: there is a certain myth of German efficiency and modernity in Romanian consciousness which Iohannis managed to embody for the electorate. It is hard to predict who will win in the second round. Two days after the elections, Ponta announced that he will be supported by far-right Vadim Tudor who lost in the first round, but this may not necessarily prove to boost the Social-Democrat’s chances. On the other hand, Iohannis’s chances may be bolstered by the fact that during the first round tens of thousands of Romanians living abroad in various cities in Western Europe were unable to vote despite standing in line for hours. This was officially caused by a procedural change which meant that people had to fill in forms which prolonged the voting process too much to let everyone in to the overbooked voting points. Yet many think that it was an intentional strategy by Ponta’s party to exclude Romanians abroad who would have voted against him. Indeed, polls show that if only Romanians abroad had voted, Iohannis would have won 46 percent and Ponta 16 percent. Sitting for hours in front of the embassies in London, Paris or Munchen, Romanians screamed “Down with Ponta” and promised to return for the second round. The drama of the Romanians abroad was experienced domestically too, where the topic was intensely debated by the media and solidarity actions were organised. The exclusion from voting fed very well into the narrative of “absolute evil Ponta” who must be defeated at all costs. Yet what is more concerning to me is that the two candidates facing off in the last round (and the visions of Romania that they expound) may not be as different as many Romanians imagine today. Certainly, Iohannis has a much cleaner political record than Ponta, but he too has faced investigations for how he acquired some of his property and for possible conflicts of interests. More importantly, though, not long ago Ponta and Iohannis were political allies sharing the common purpose of getting rid of Traian Basescu. Their two parties, the Social-Democrats and the Liberals, formed an alliance in 2011 which had as a goal to bring to power Ponta as president and Iohannis as prime minister. The fact that we consider them arch-rivals today only means that we have a very short memory. Finally, as some commentators pointed out, despite belonging nominally to the “left” and the “right”, the political platforms of the two main candidates are perhaps not that far apart. Ponta’s programme for a “pro-business left” is certainly no solid left-wing platform that would tackle social injustice but constitutes rather a mix of pro-business and pro-poor measures which are not fully elaborated. Iohannis’s liberal vision is similarly vague on the details. Despite the strong emotions sparked by these elections, it is doubtful whether the result on November 16 would dramatically alter the fate of Romania. For bigger changes, we would need to go beyond symbolic struggles of good vs. evil. We would need to seriously interrogate the programmes of the candidates, force them to debate real issues and problems confronting our society today, and pressure them to come up with serious proposals. This has yet to happen.